Cairo is an exciting place to live and work - being the largest urban metropolis on the African continents and the location of the last remaining original Seven Wonders of the world, Cairo has something for everyone, old and new. See our 'CAWU Guide to Cairo’ for a few tips on how to get around, what to see, where to eat, renew your visa, etc. The CAWU office is located in the quiet leafy suburb of Maadi, which lies a few kilometers south of the city centre. It is easy to get here on the metro from anywhere in town. Pay E£1 and take Line 1 towards Helwan. Get off at Maadi Station. When you exit the Metro on Street 9 - a haven of cafes and restaurants - walk down Street 79 opposite the station exit for two blocks. After two blocks, Street Waheeb Doos will irregularly cross the junction between Street 11 and 79. Take Street Waheeb Doos at an angle to your left and continue on until you hit a large roundabout - this is Sawares Square (Midan Sawares). From here be careful of traffic and circle round to the left onto Street 77, this will turn into Street 14b upon which our office is located. Most taxis and tuktuk drivers will known Sawares Square (Midan Sawares) a chaotic intersection where Ahmed Zaki Street meets Canal Street and a number of other smaller roads. This is your best bet. 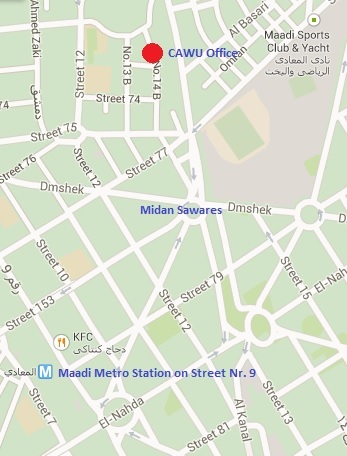 Otherwise take a taxi to Street Nine in Maadi and walk following the directions in the Metro section.